This collection of 24,500 specimens, representing about 3,000 species, is approximately fifth largest in the world in number of specimens and species. In 1992, the Florida Museum received the Recent bird skeleton collection assembled by Prof. Pierce Brodkorb of the University of Florida’s Department of Zoology. 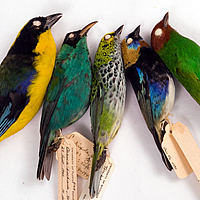 With the assistance of an NSF collection improvement grant, this skeleton collection was computer-cataloged and integrated into the Florida Museum bird collection (already computerized in 1992-1994). The skeleton collection has grown by 140% in the last five years. It contains specimens from 47 U.S. states and 103 countries. The top ten states are: FL with 11,169 specimens; CA with 638; ME 227; MA 218; GA 213; AK 201; NY 154; TX 142; AZ 140; VA 124. The top ten countries are: US 13,282; Mexico 745; Netherlands 397; Costa Rica 320; Kenya 312; Panama 252; Zimbabwe 217; Suriname 213; Canada 198; Australia 124. Taxonomically the collection ranges across the class Aves, representing 23 orders, 128 families, and 950 genera. The bird skin collection contains approximately 20,500 specimens representing at least 2,300 species. These are mostly study skins, but in recent years we have prepared a large proportion of new specimens as flat skins or spread wings with associated skeletons. In 1992, the division also received the collection of approximately 3,000 skins assembled by Prof. Brodkorb. The skin collection has grown by 23% in the last five years. It is 99% computerized and contains specimens from 45 U.S. states and 77 countries. The top ten states are: FL with 7,451 specimens; GA with 265; RI 244; CT 197; CA 173; MA 168; SC 134; ME 86; NC 86; AK 84. The top ten countries are: US 9,696; Mexico 1,513; Honduras 730; Kenya 276; Colombia 204; Cuba 153; Philippines 117; Canada 104; Suriname 101; Haiti 99. Also wide-ranging taxonomically, it represents 27 orders, 129 families, and 850 genera. Rarities include skins of extinct Ivory-billed Woodpeckers, Dusky Seaside Sparrows, Passenger Pigeons, and Carolina Parakeets. The egg collection, consisting of 10,400 sets representing 733 species, is 11th largest in North America in number of sets and 15th largest in number of species. It represents approximately 90% of the species and subspecies of North American birds. The egg collection has grown by 1% in the last five years. It is cataloged in a card file that includes original collectors’ data slips or page references to the collector’s field notes. Especially well represented are sets from New England and Florida. 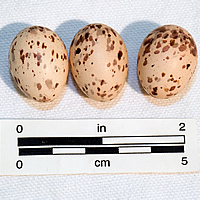 The collection is rich in sets of raptor eggs, including Bald Eagles, Ospreys, Broad-winged Hawks, Red-shouldered Hawks, Crested Caracaras, and American Kestrels, and the Florida races of Seaside Sparrows and Clapper Rails. Rarities include sets of Passenger Pigeon, Carolina Parakeet, and Bachman’s Warbler eggs. The egg collection data have been entered in a database but it is not yet online. In the meantime you can download a list of the species in the egg collection. 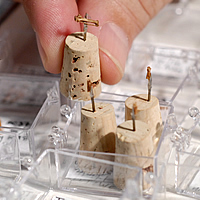 The bird sound collection, in the Florida Museum Bioacoustic Archives, with 27,500 cataloged recordings representing about 3,000 species, is perhaps third or fourth largest in the world in number of species. In the western hemisphere it is the second largest in number of species and third largest in number of recordings. We are now processing one of our largest accessions ever, the collection of Ben B. Coffey, Jr., with thousands of high-quality recordings from the southeastern USA and the Neotropics. The sound collection has grown by 20% in the last five years, not counting the Coffey accession. It is cataloged entirely on computer. Geographical strengths include North America, especially Florida, and the Neotropics, with smaller but notable numbers of recordings from Africa, Australia, and Southeast Asia. Some taxonomic groups especially well represented are tinamous, trogons, woodpeckers, antbirds, New World flycatchers, wrens, New World wood warblers, and corvids. To request copies of these recordings in .wav format, write to collection manager Tom Webber. The Bird Sounds Collection Catalog on the FLMNH web site is not automatically brought up to date as we add recordings to our database. 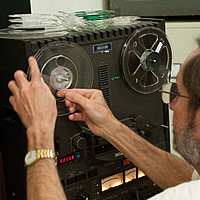 To see a partial list of recordings (about 4,000) digitized and cataloged, but not yet available on our web site, download this document. To request copies of recordings on this list, or any other recordings you think we may have, write to Tom Webber. American philosopher Charles Hartshorne (1897-2000) had a long association with former FLMNH bird curator Dr. Bill Hardy through their mutual interest in bird sounds. 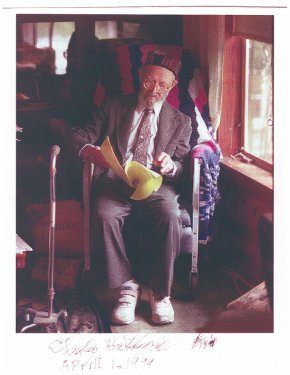 Prof. Hartshorne was a productive and highly influential scholar in his field of philosophical study, and also a serious lifelong student of birds and especially bird songs. Through his local field work, his travels, and his discerning study of audio recordings from around the world, he developed an unexcelled knowledge of the whole Earth’s bird-song variety. Among the products of his inquiry were his widely discussed “monotony threshold hypothesis,” an explanation of why birds introduce variety into their singing performances, and his classic book Born to Sing, an Interpretation and World Survey of Bird Song (1973, re-issued in 1992). For further information on any of these collections, or to arrange for examination of particular specimens, please contact a Collection Manager.